Two great resources for you to download! Last week we debuted the “How to Create and Utilize the Perfect Resource Box” video to help you better understand the most powerful tool in your article marketing toolbox – the Resource Box. As an added bonus, Chris Knight recorded an exclusive audio file today packed with sure-fire tips and hints for what to include, and not include, in your resource box. You’ll also discover the “why’s” behind these tips and hints. Article Marketing 101: The Perfect Author Resource Box. Start using your “new and improved” resource box today on all of your fresh, high-quality articles. In no time, you’ll be reaping the benefits of additional traffic, increased credibility and improved sales. Nice job with the audio and I really appreciate the handy PDF showing how to create a great resource box. 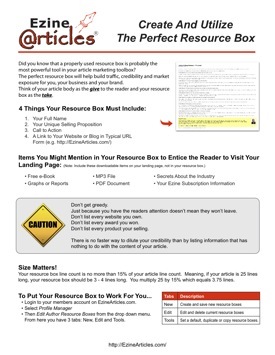 In my view the resource box is perhaps the most important part of the whole ezine experience. Get this wrong and the proability of being overlooked is very high. Great PDF nice and handy and not too overwhelming in the detail. MP3 was good too. Thanks again Chris, one of our largest sources of visitors is EzineArticles.com and we appreciate all you do to help us grow our businesses. I had a problem with one of the embedded fonts. Can’t read the first paragraph. Does anyone have any quantifiable data on the difference in click rates from a superb resource box and just an average one? Real Data with real numbers? Hey Chris, is it just me, or is there a problem with the PDF link (re the resource box story) on your email. I appreciate your Resource Box advice. I also enjoyed reading Chris’ article (Article Marketing 101 ..) and his call to action. It’s definitely information I will use. A resource box samples package would be a nice complement to the information you’ve already provided. I recommend that you try access it with a different browser (FireFox, MSIE, Chrome, Safari, Opera, etc). If that doesn’t work, then try installing or re-installing Adobe Acrobat or the free Adobe Reader. Chris, thanks for the pdf url access tip. From a Down Under mate…you fellows are doing a great job! This really helped to take the Resource Box to another level of understanding. All your tips are great! Not a bad idea! We’ll explore it and perhaps you’ll see some Resource Box templates here soon. I love this idea of the Resource Box. Kind of like giving out a free postcard or business card. Good info re the resource box! It never really occured to me put a name in the box, but I could see how this could immediately start a relationship with a reader and enhance CTR. I’ll be testing that out from now on. Thanks for sharing via audio. Using a USP is critical and not nearly enough people do it. Heck most people don’t even have one. It you have a great USP 80% of your work is done. Great training info. I am looking forward to Article Marketing 101. Writing with a pull, using the suggestions given will help us help others receive valuable content information. …as they say some of us better learners through images and audio then txt on paper…good job Chris ! I can’t wait to listen to the MP3 and read the PDF. Thanks Chris, I can really us some help on crafting a better resource box. First, thanks for the info. Always appreciated. I am curious as to why you recommend putting your plain url into the Resource box as opposed to using your keyword alt text. Also, I was under the impression we could have 2 urls in there. I’ve seen quite a few articles that put one url using the keyword alt text and the other link as the plain url to your site. Finally, what did you use to create the pdf? Microsoft Word? The reason I ask is that it looks great!! Because Webmasters who reprint your article can be incompetent sometimes (often) and if you have a regular full http:// URL, their CMS often makes up for their inability to get the active link right whereas in many cases, if all you have is 2 anchored text links, you may get no link back to your website. It’s all about traffic! Therefore, include one regular URL at least. Also, we’ve got inside stats that further confirms that full http:// URL’s are clicked more than anchored text links, especially on our members most viewed articles. This isn’t true in every case, but it makes a case for why you should consider including a regular URL. I believe either Shaun or Marc in our Marketing team created the PDF and they most likely used Adobe Illustrator to produce it. I have to admit, the size was a heck of a lot more than I expected. But, the quality is great and makes all the difference in the world and is well worth it. The resource advise really helped.